In the Música de Navidad series, students experience the rhythms, styles, and musical characteristics of Latin American music while exploring the holiday traditions of this part of the world. Each piece begins with a short rhythm exercise that prepares students for the rhythm patterns featured in the arrangement. Familiar Christmas carols are creatively given a Latin American flair, and some traditional Mexican and Andalusian carols are included as well. Brief descriptions of Latin American Christmas traditions help to spark the imagination of the performers. 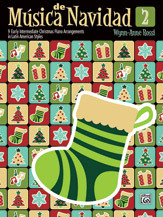 Book 2 is arranged for students at the early intermediate level.Titles: Ángeles cantando están (Angels We Have Heard On High) * Hacia Belen va una burra (A Donkey Is Going to Bethlehem) * Jesús en el pesebre (Away in a Manger) * Las posadas (The Inns) * Noche de paz (Silent Night) * Oh árbol de Navidad (O Christmas Tree) * ¿Que nino es este? (What Child Is This?) * Ve, dilo en las montanas (Go, Tell It on the Mountain) * Ya llego la Navidad (Deck the Halls).